Matt I just want to say Bravo and thank you for all of your work on this. Fascinating stuff really. 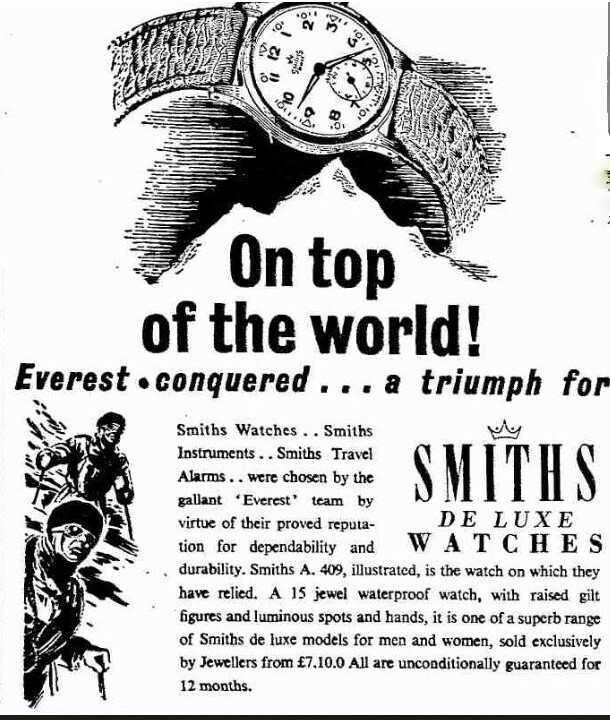 Watches on the summit of Everest in 1953, the final and definitive answer. After a lot of research and following a series of recent (and ancient) discussions here and in several other forums, I think I'm finally in a position to give a tidy and definitive answer to this question. 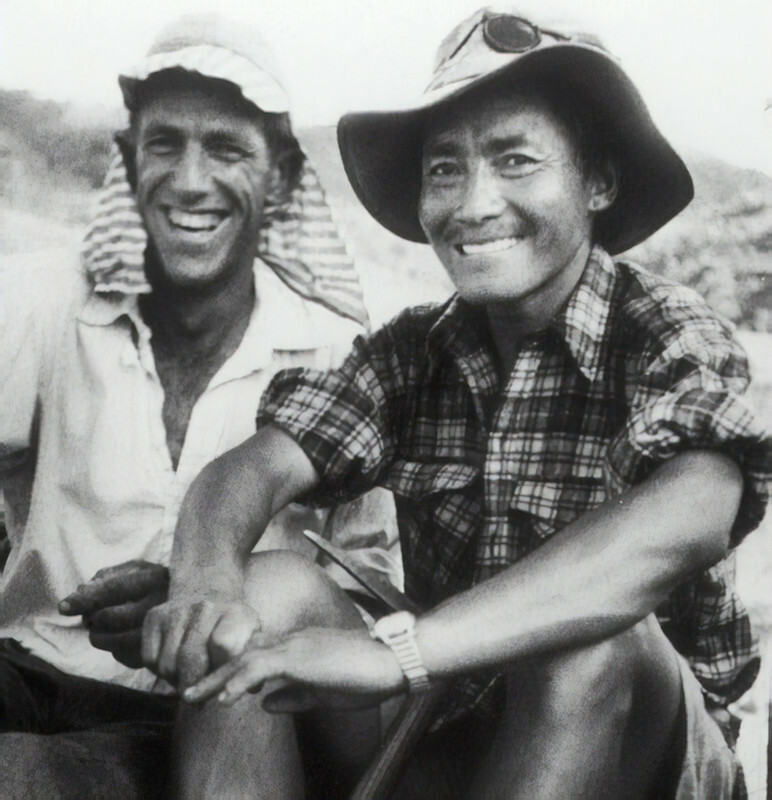 The fact is that the 1953 Everest expedition was equipped with watches from both Rolex and Smiths. These were distributed unevenly across the team, with some members ending up with multiple watches and others ending up with a single watch. 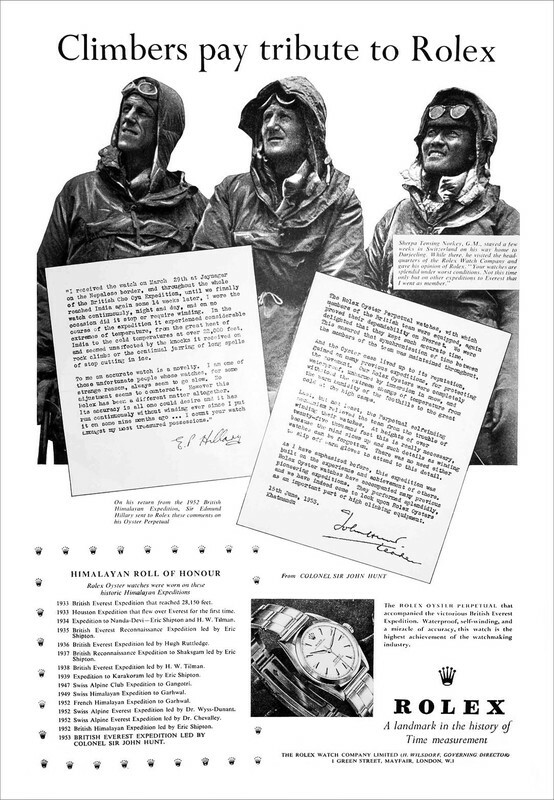 In addition to this, Rolex gave watches to several members of the expedition before and after the successful ascent. They also advertised heavily, and in ways that appear to be designed to be misconstrued in Rolex favour, from the moment the news broke to the present day. This has caused confusion for over seventy years and has allowed a lot of misleading, and downright false, stories to circulate, percolate and become close to common knowledge. 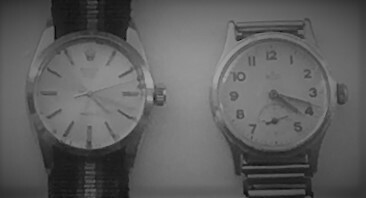 In this thread, my intention is to demonstrate through a series of primary photographic and documentary sources, combined with deduction from those sources, that there were only two watches carried to the summit and that both of those watches were custom made Smiths, identified as the 'A409' by Smiths, but actually an amalgam of the Smiths A404 'Tropical' case by Dennison, the Smiths Cal.40 '1215' movement and a custom made dial with shaded numerals that shared elements of the Benson Tropical and the Smiths A404. To put it another way, the watches were standard Early Smiths A404 (with 18mm lugs) but with a custom dial and special preparation. 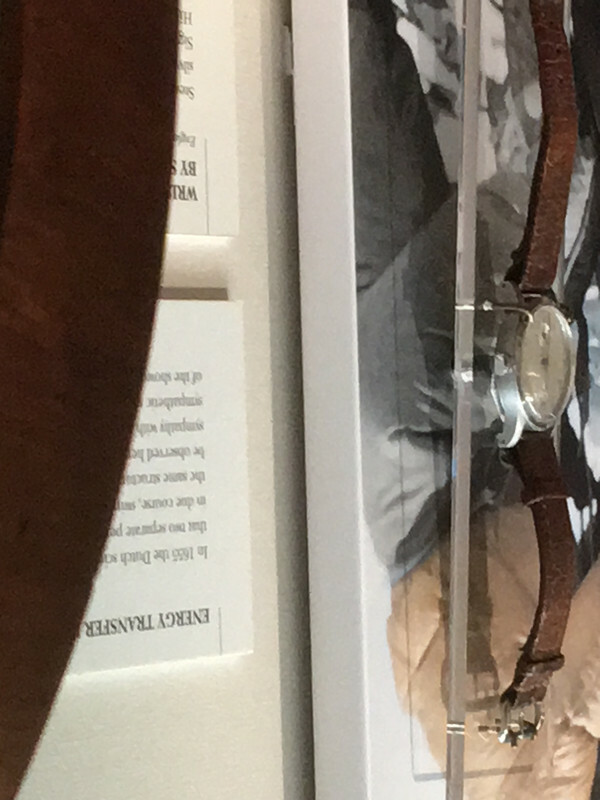 One of these watches, Hillary's, is in The Science Museum in London. There were two attempts to reach the summit. The first, by Charles Evans and Tom Bourdillon, failed; the sufficient cause of their failure was the failure, due to ice, of their oxygen systems, these were an experimental setup, designed by Bourdillon himself (who really was a Farnborough rocket scientist!) the system was known to be troublesome but was infinitely more efficient and economical when working. HIllary and Norgay used an open breather system that was substantially unchanged from the system used by Mallory in 1954. Both Evans and Bourdillon wore Rolex 6098 watches. These were a standard Rolex model available commercially at the time which combined an A296 winding module with a Cal.765 movement in a 35.5mm 'Big Bubbleback' case. Bourdillon's and Evans' can be clearly identified in photographs of them during the expedition and on their return to camp IV after the failed attempt. Evans' has surfaced in the public domain and pictures of it are all over the internet. Had they succeeded, it is clear that the watch on the summit would have been a standard Rolex 6098 with a white pointed baton dial. Rolex's advertising department would have had a field day. They didn't. The rest is history. I'm going to divide this post into two halves. 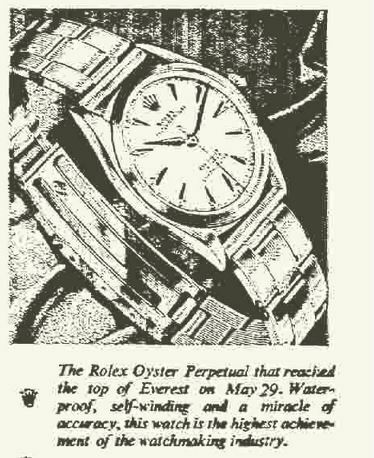 First I intend to demonstrate that there was no Rolex on the summit of Everest in 1953. Obviously, proving a negative is notoriously difficult and, many would say, impossible. However, I reckon I'll have a go. The latter half of this section relies extensively on documents dug out of the BHI archives by Broussard over at TZ- UK, who really deserves the credit for the evidence at the heart of that segment of my argument. Everest's summit was reached on the 29th of May at 11:30 am local (Nepal is six hours ahead +BST making it 6:30pm in London). The expedition was equipped with heavy, low powered short range radios. 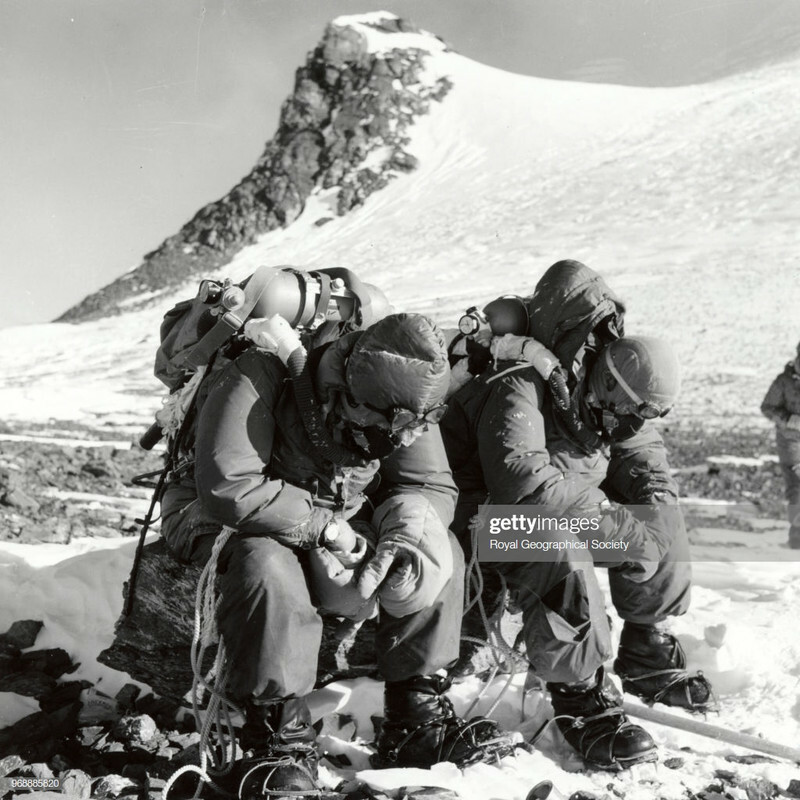 The summit party were not carrying them and did not contact anyone until they met Lowe near Camp IV some five hours later. 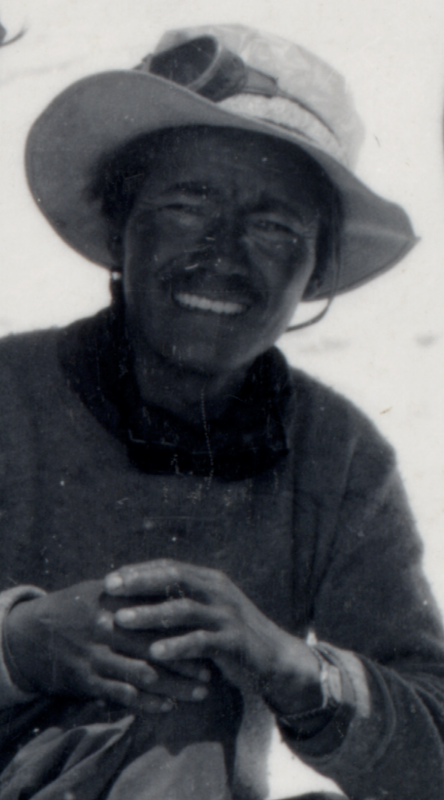 At this point, base camp was contacted and James Morris, the correspondent for the Times (who had a binding copyright deal with the Royal Geographical Society that had been rigorously enforced) made his way down the Mountain and back across the treacherous Khumbu glacier with Mike Westmacott. 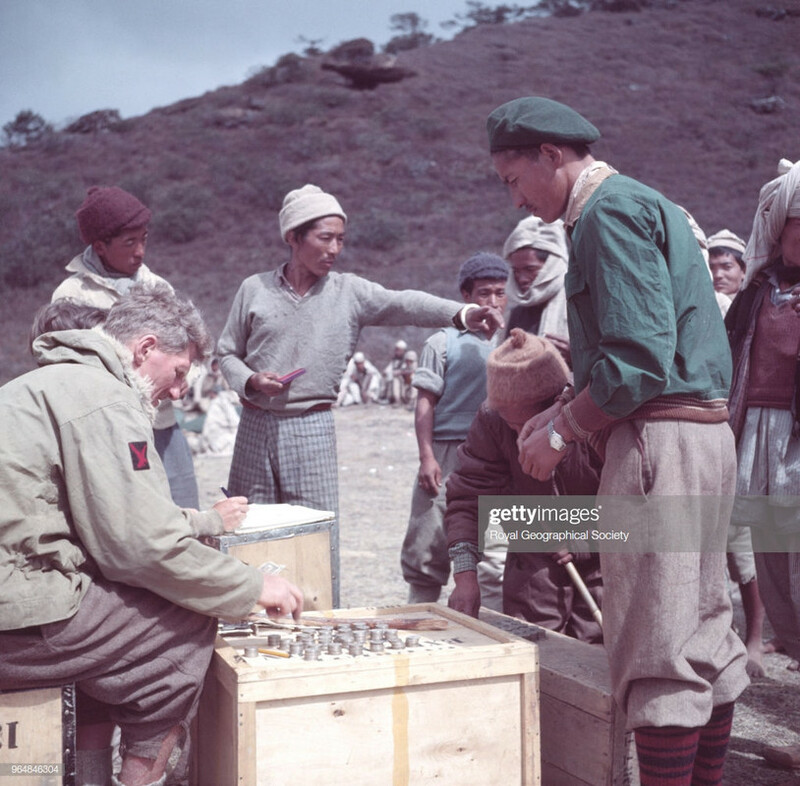 They then contracted a local runner to carry the message to an Indian Army outpost at Namche Bazaar some twenty miles away. At this point, people at the base of the mountain began to discover that Everest had been conquered, but no one but Morris and Westmacott knew by whom. To ensure this secrecy, Morris had arranged a series of elaborate codes to identify the climbers who had reached the summit. This is one of the very few adverts that ever explicitly claims that Rolex were worn on the summit. However, it claims it repeatedly and clearly in full expectation that the claim will be proven to be correct. that this was a gift, but it could just as well be coincidence and opportunism from Rolex. 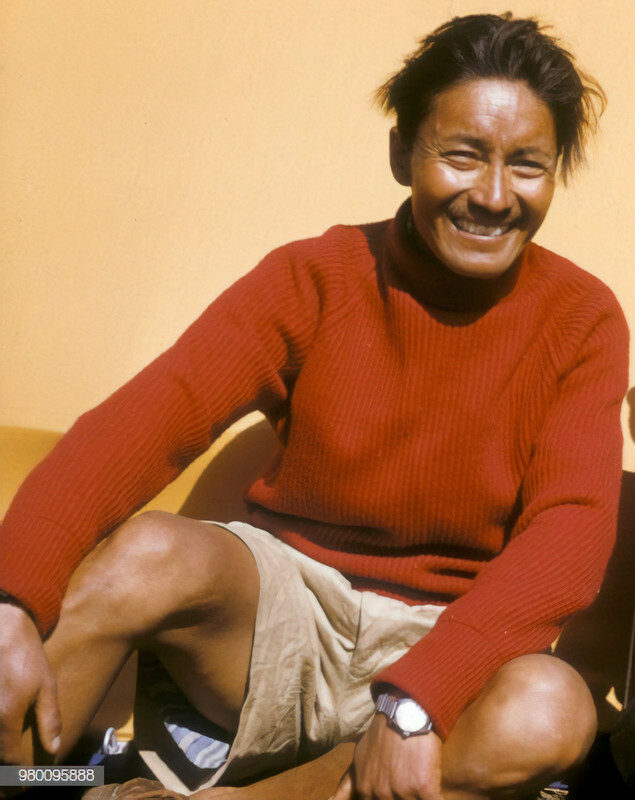 central role in the exploration and conquering of Everest and was on the summit with Tenzing and Hillary. On the face of it, this was a triumph for Rolex. Peerbhoy accompanied the victorious mountaineers to Calcutta where Bosecks Jewellers were remarkably generous to the heroic team, wrote much of the copy that is now so well known, and was given a solid gold Rolex for his role in what looked at the time like an unambiguous advertising coup for Rolex. However, after a few months and some equally gold plated advertising, this rosy picture started to sour. Half way through this first section, I'd like to pause and take stock. It's very clear that getting a Rolex to the top of Everest first is extremely important to Rolex. They had their response in place and, through their ad agency, went to some length to have an advert that was almost as much of a scoop as the Times' Scoop it accompanied. In fact the advert came before the main story which was actually on page six! It bears repeating that the supposed fact that a Rolex had made it to the summit is stated explicitly several times and heavily implied repeatedly. They'd worked for this success and were justifiably proud that Rolex had finally got it. Hillary's testimonial doesn't refer to the Everest expedition, but to the Cho Oyu Expedition the previous year. 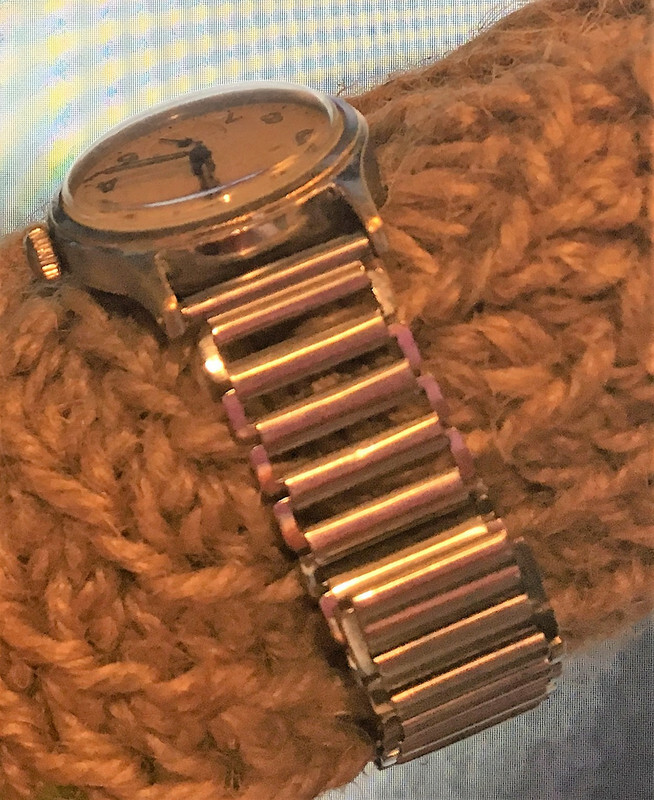 The watch that had 'become a treasured possession' has never been seen anywhere and was not in the collection his family attempted to auction. The Royal Geographical Society archives has no mention of watches being given by Rolex that year (and I've read every scrap of paper on '51 and '52 in their archive) there are no photographs that I have seen that feature him wearing a Rolex between arriving in the Himalayas for the first time in 1951 and receiving Rolex from Bosecks in 1953, but there are photographs of him wearing what looks like a small Taubert cased watch. It's all most peculiar. Another curious but inevitable result of climbing above 25,000 feet is that the mind tends to become numb and dazed. A climber tends to forget details such as winding his watch; he doesn't want to be bothered with this when all his energy is concentrated on the climb. 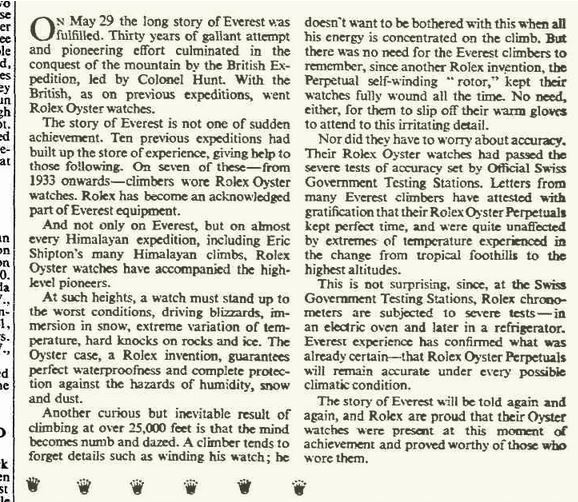 But there was no need for the Everest climbers to remember since another Rolex invention, the perpetual self winding 'rotor,' kept their watches fully wound all the time. No need, either, for them to slip off their warm gloves to attend to this irritating detail. Last but not least, the Perpetual selfwinding mechanism relieved the team from the trouble of winding their watches. At heights of over twenty-five thousand feet, this is really necessary, because the mind slows up and such details as winding watches can be forgotten. There was no need either to slip off warm gloves to attend to this detail. As if that wasn't bad enough, Hunt had never been on an Everest expedition before. He had applied for one but been turned down. As such all the talk of previous experiences on Everest seems slightly inauthentic to say the least. The most likely explanation was that the copy was written for him and he merely signed off on it. The other possibility was that he simply copied earlier Rolex adverts. The degree of similarity between Hunt's words and earlier adverts is far too great for any possible coincidence. 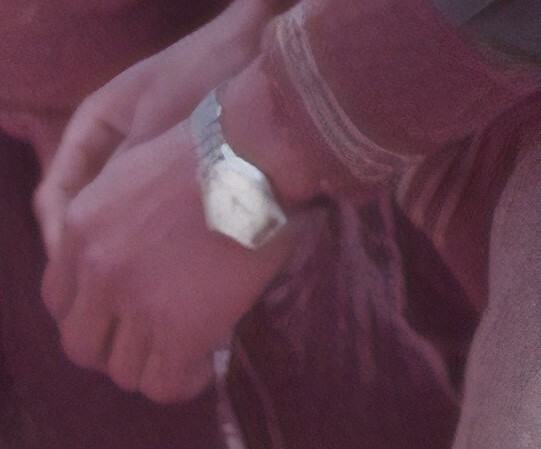 There are literally dozens of colour photographs that show him wearing an unambiguously steel watch on an equally steel bonklip style bracelet. There are also a few black and white ones of the same watch on the same strap that don't look remotely like a Rolex, but that's getting ahead of my argument. It is at this point that things start to go downhill rapidly for Rolex. Unsurprisingly, there had been a great deal of interest in the expedition and some of our WIS forebears had, quite naturally and properly, taken an interest. This was expressed in the nearest thing that watch folk had to a watch forum at the time: the letters page of the BHI journal. It's here that I am indebted to Broussard for his stellar research and indeed the BNI and AHS for preserving such interesting information. 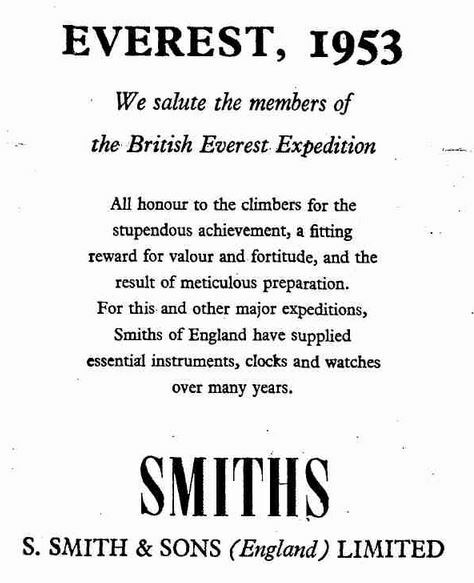 Smiths claim that every member of the British Mount Everest Expedition was equipped with one of their watches. We also are aware that the Rolex Watch Co. claim that Colonel Hunt, Mr. Hillary and Sherpa Tensing wore Rolex Perpetual Oysters. Are we to presume that at least three members of the expedition wore one watch on each wrist?" Now that is wonderfully unambiguous and leaves very little wriggle room. However, it also very much leaves the ball in Rolex's court. At this point, Rolex have all the advantages, the three men who are most in a position to counter this unambiguous claim by Smiths are Working with, or for, Rolex. 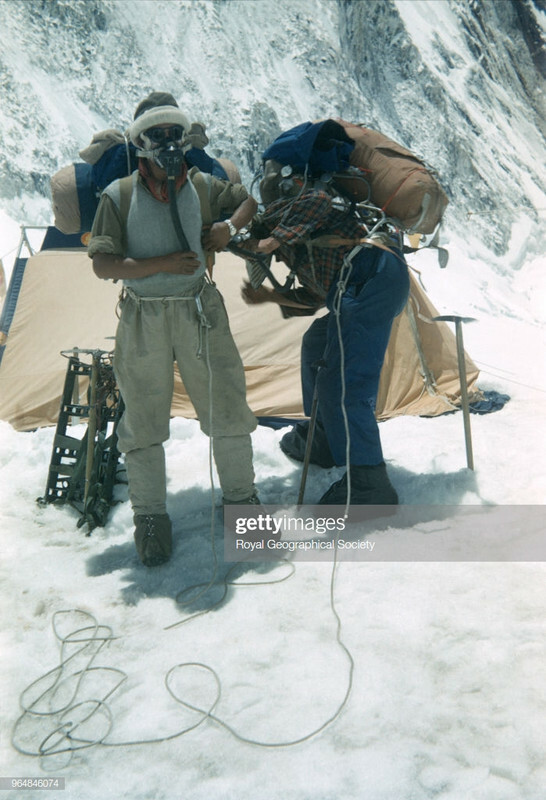 Getting a Rolex to the top of Everest has been a decades long project for Rolex and it's simply beyond credibility that they haven't debriefed Hillary and Tenzing thoroughly. This would presumably include extended testimonials, pictures of watches, watches as potential museum exhibits and so on. At the very least, it means that Rolex, as an organisation, would be utterly unambiguously clear about precisely who wore what on the top of Everest. They had access to the principle players. They cared intensely about what happened and there was a great deal of pride and advertising capital at stake. It is unthinkable that Rolex didn't look into this carefully and thoroughly before conceding the summit to Smiths. They'd been waiting decades, had assumed success and then had that success whipped from under them by a whisker. 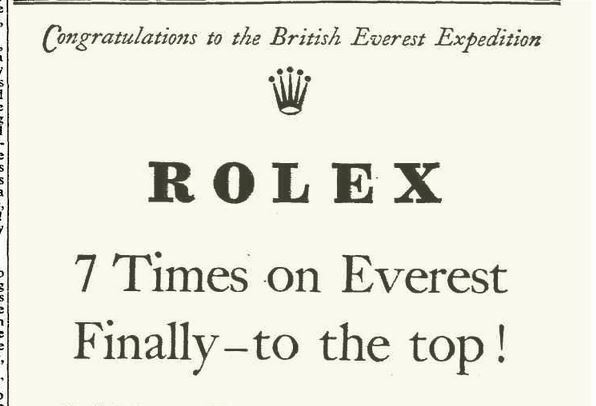 Everest in 1953 and, in every advert that comes after that admission Rolex are scrupulous to never again claim explicitly that there was a Rolex on the summit in 1953. They certainly imply it incredibly strongly, but it is only in those few early adverts that the explicit claim of reaching the summit is made. This gives us a perfect example, if one was needed, of precisely how Rolex would behave if they thought that there was even the whisker of a chance that a Rolex had been on the Summit with Tenzing and Hillary. For that testimonial to be in Hunt's own words, he'd have to have written it, in the past tense, predicting the future performance of the team's Rolex, before he set off. Rolex must then have copied his words in their adverts because many of the words, phrases and sentiments found in it can be found in other Rolex adverts. Adverts that were in print before Hunt returned, like the one published in the Times on the second of June when literally no contact with Hunt was possible. This seems far fetched. Returning to my main point, for there to have been a Rolex on the summit of Everest, either it was there without anyone realising or Hillary, Tenzing or Rolex must have decided to conceal that fact. 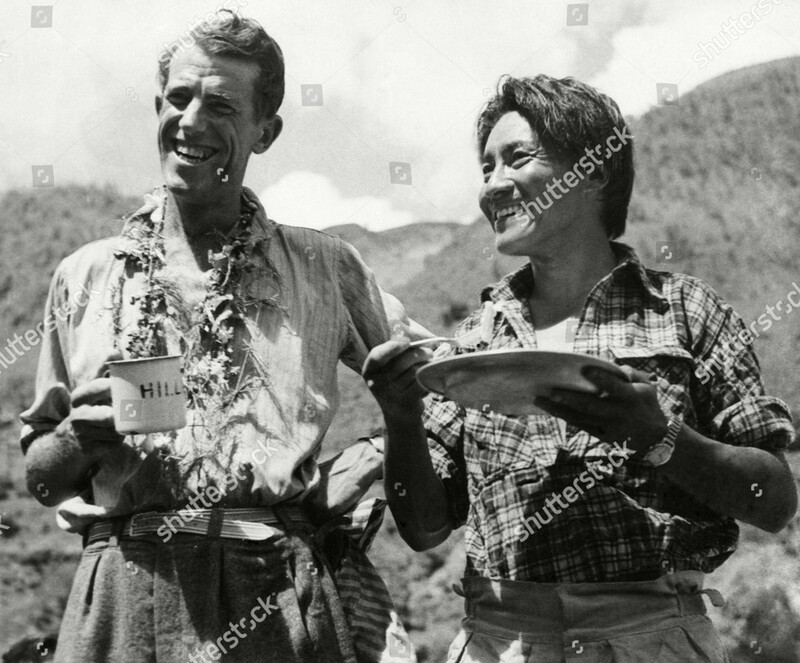 Both Hillary and Tenzing became enthusiastic promoters of Rolex after the expedition. They'd have every motive to say there was and no reason to conceal a Rolex on the summit if one had been there. 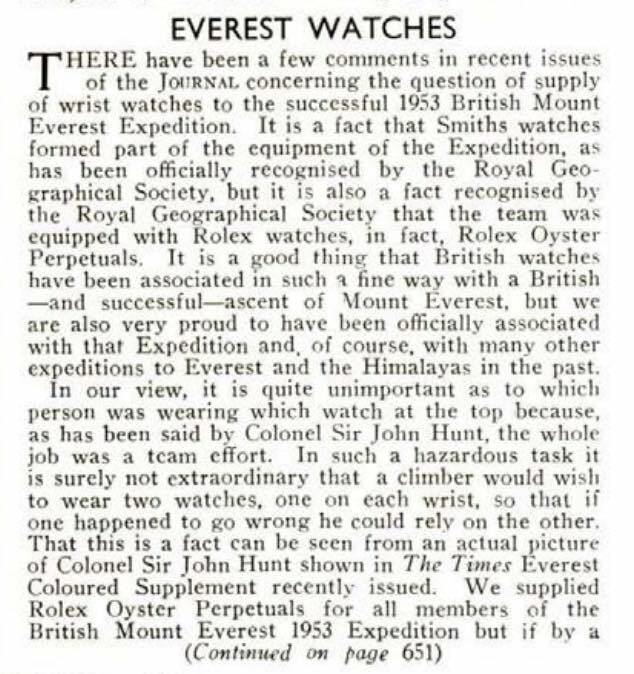 Likewise, the idea that Rolex wouldn't advertise the presence of a Rolex on the summit of Everest in 1953 if there had been one is literally unthinkable. They did it when they thought there was and they did it later when other expeditions reached the summit. 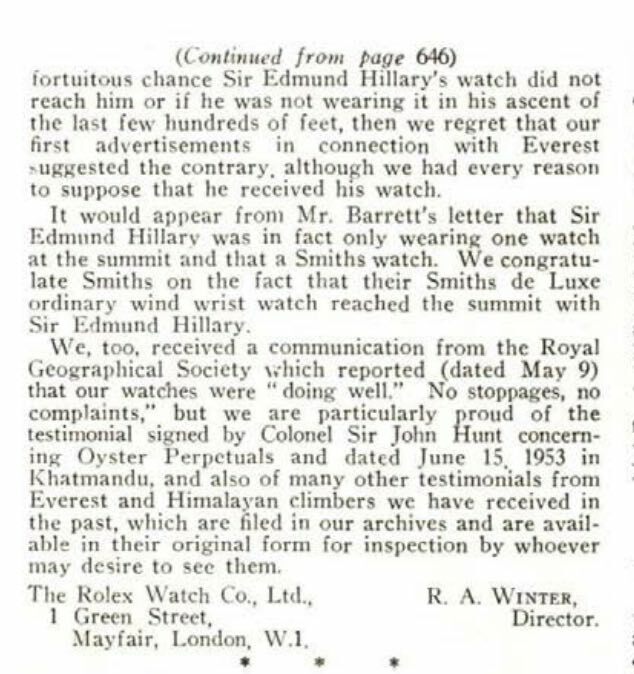 Therefore, it is clear that neither Tenzing, nor Hillary nor Rolex believed there ever was a Rolex on the summit of Everest in 1953. No one is better placed to be sure about that. That's got to put the matter well beyond all reasonable doubt. 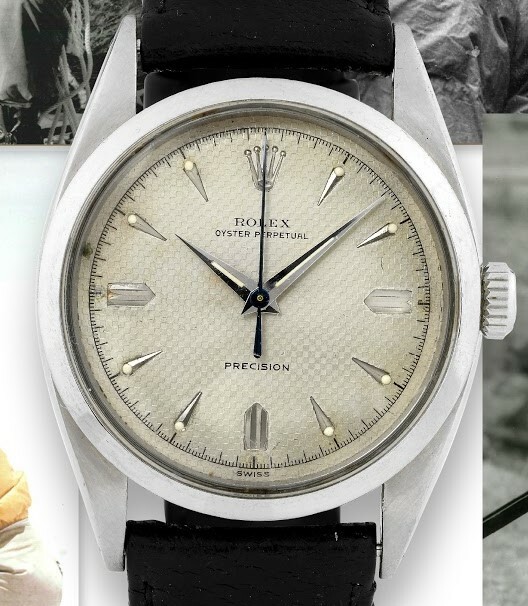 As it is, the fact is that not only were Rolex pipped to the post by Smiths, but also, in 1956, by Enicar with their 'hamster ear' lugged Seapearl 600, precisely the same watch accepted by the US Navy when they rejected the Sub, but also by the Tianjin clock and watch company with the ZhuFeng (yup, it means Everest!) 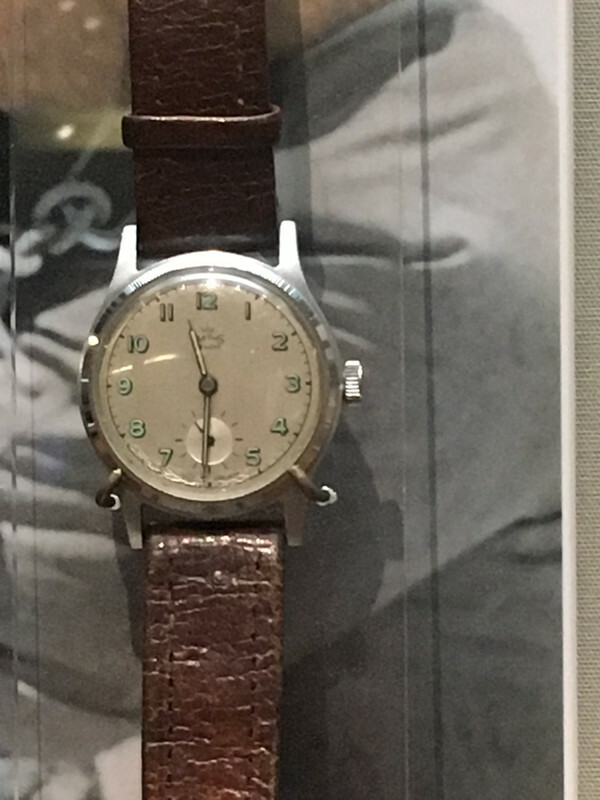 watches that equipped the 1960 Chinese team. It wasn't until a decade later that, finally, a Rolex was seen on top of Everest. So that's the negative case. Thanks to Tribe125 for suggesting I posted something (and the odd inspirational Smiths) and Broker for his kind words and reputation. I hope this is a suitable return! Now I have stuff to do and will get on to the positive case later. So how about the positive case? This is simpler and requires a lot less typing. I'll start with a simplifying assumption. 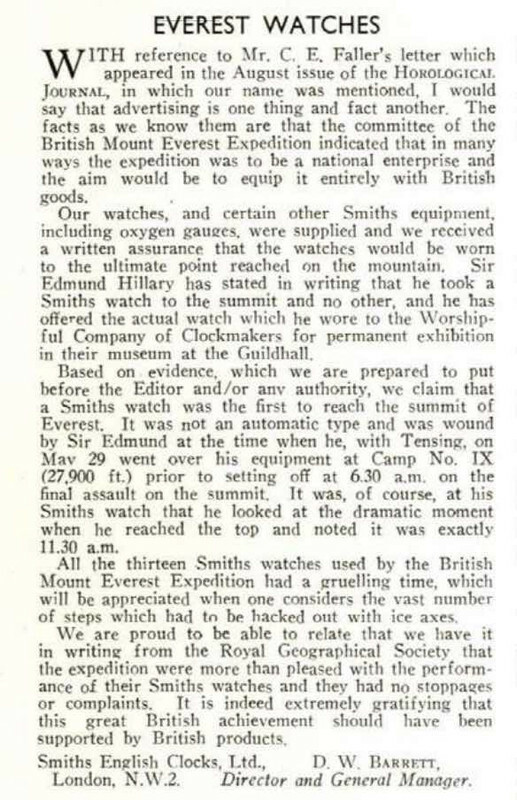 Given that there is already solid written evidence that Hillary wore a Smiths A409 on the summit of Everest, a watch he gave to the Worshipful Company of Clockmakers and which has been in their collection ever since, I'll take that as a given. 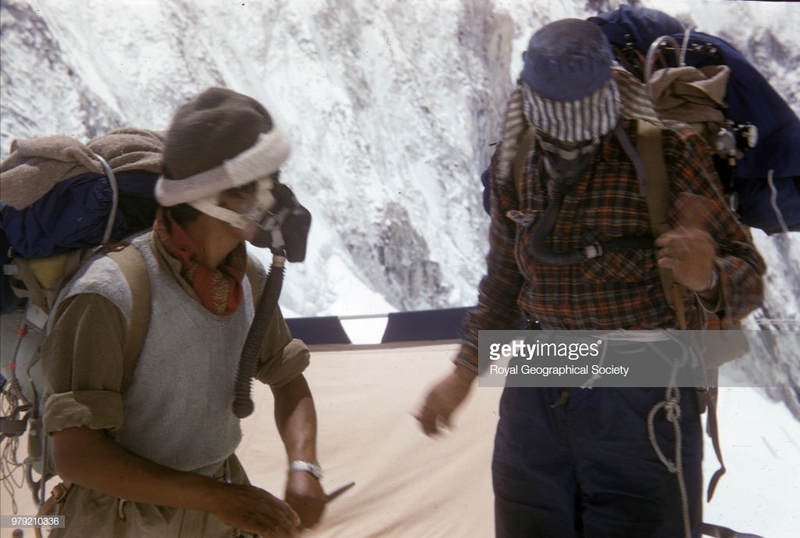 The question is what Norgay is wearing, as he is traditionally the person who wore a Rolex on the summit. I hope any reader is now clear that he didn't and so the question is what he wore. The fortunate fact is that while the Rolex 6098 and the Smiths A409 are both about the same size and both have off white dials they are actually quite distinct watches. Looking at the two from the side and an angle note the way that the Rolex lugs have far more curve and taper to almost a point while the Smiths is blunt. Also note the way the light reflects of the polished sides of the Rolex and the brushed sides of the Smiths. 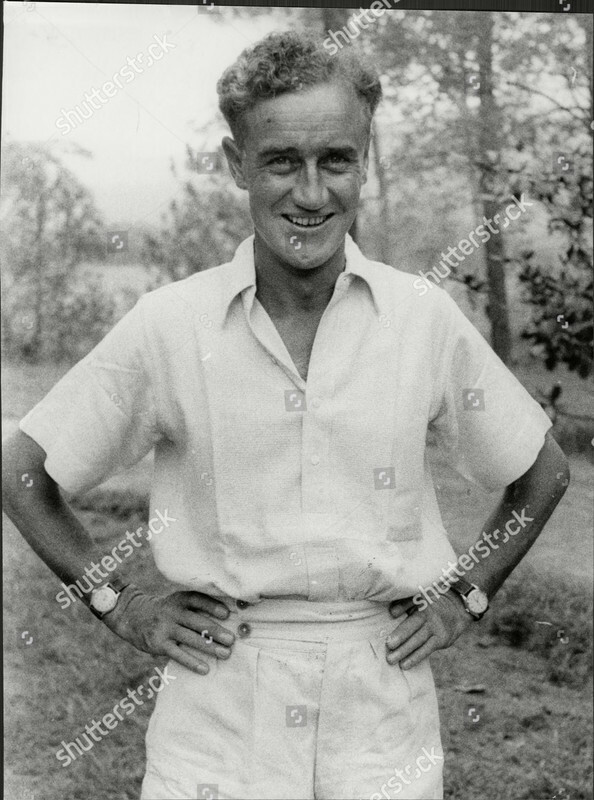 I assume that, looking at the wrists of Charles Wylie, when he is wearing both it is clear that the Smiths is on the left of the picture, that is, his right hand and the Rolex is to the right of the picture. So, I hope that's a satisfactory introduction to the sorts of differences between the two watches that are potentially going to be obvious in a grainy picture. I'm not intending to claim that any single photograph is, of itself a smoking gun. 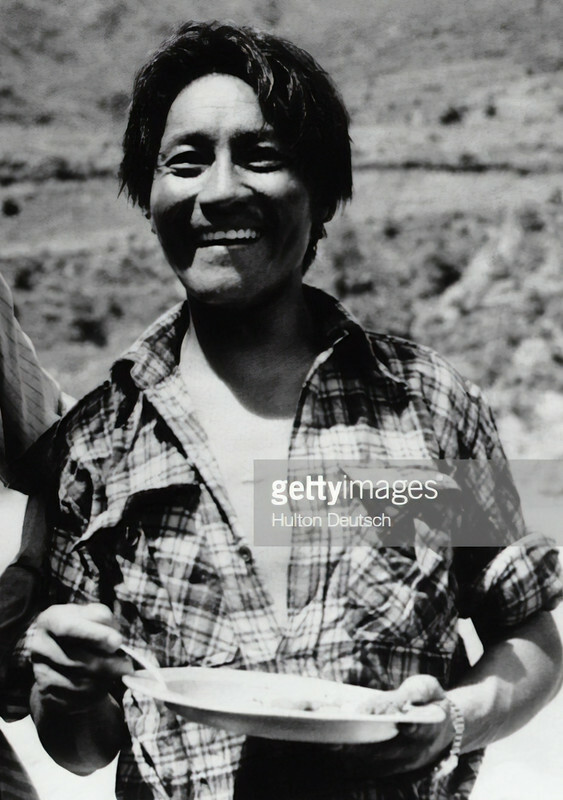 What I want to argue is that there is a single watch worn by Tenzing while on Everest and it's possible to establish a connection between all the watches based upon the rather specific bamboo style bracelet it is attached to. It just so happens it's the standard bracelet for a West End Watch co watch, fitted to their 'Sowar' range. these were standard issue to the Indian Army from the late thirties onwards. 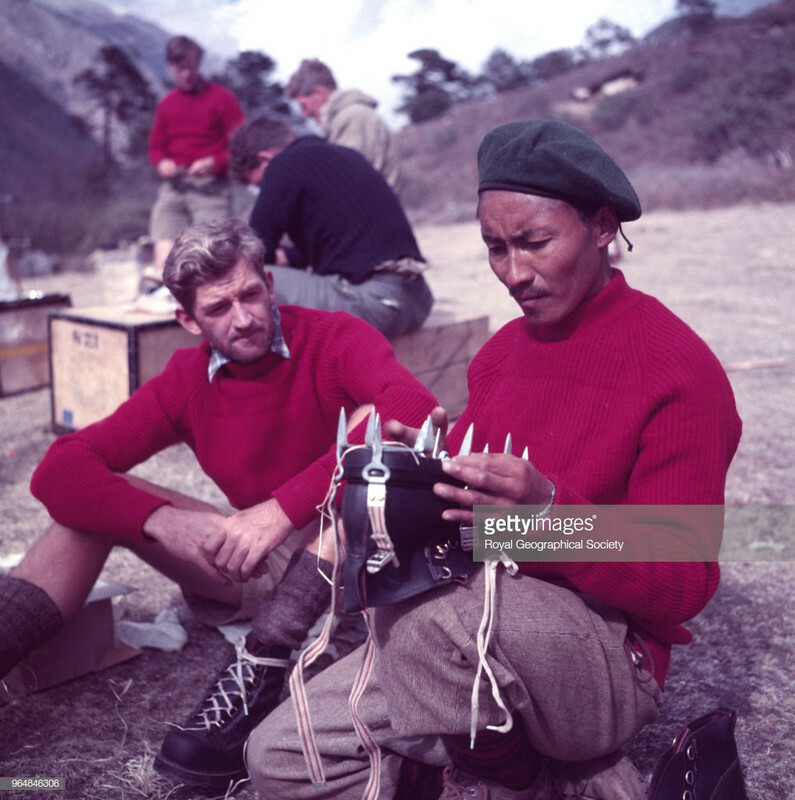 Tenzing served in the British Indian Army's Mountain artillery during WWII (as a batman). While West End are largely unheard of in the West that is precisely because they focussed on the East. They used a variation of the Taubert decagon case and are remarkably robust. It's perfectly true that it isn't always obvious that it's the A409 or the bracelet, but in the pictures I've shown it's obvious that it's one or the other. 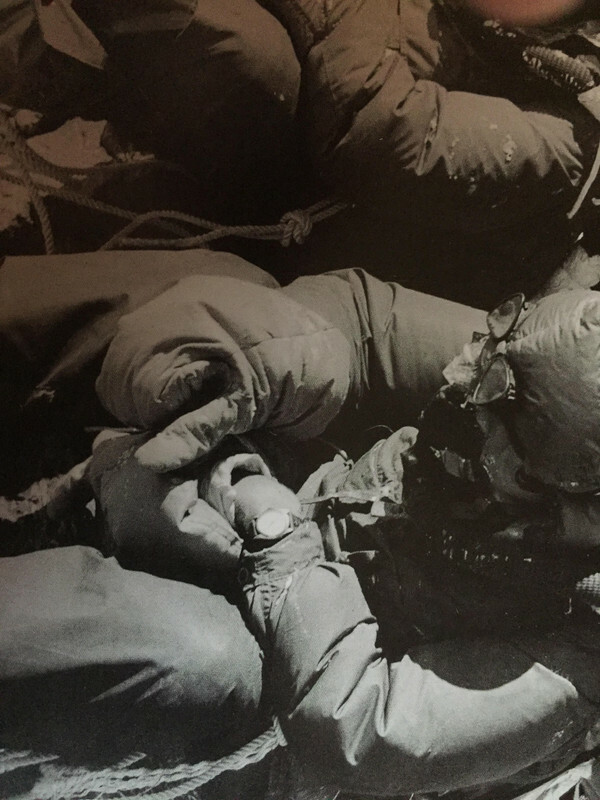 Now it's possible that Norgay had two watches both on a West End bracelet and just by coincidence he was always wearing the other one in the picture where it isn't clear, but that seems increasingly unlikely the more images from the expedition you look at. That's it really. When I look at the totality of the images I'm left quite certain that the watch in question is a Smiths A409 worn loosely on a bamboo bracelet sometimes it looks larger or smaller but when you think about it, it isn't. I think the case for what wasn't worn is bulletproof, but the case for what was really worn comes down to what you see. To me, that looks clear and obvious. but that's about as good as it gets I'm afraid.